How to setup Guest Notifications product? 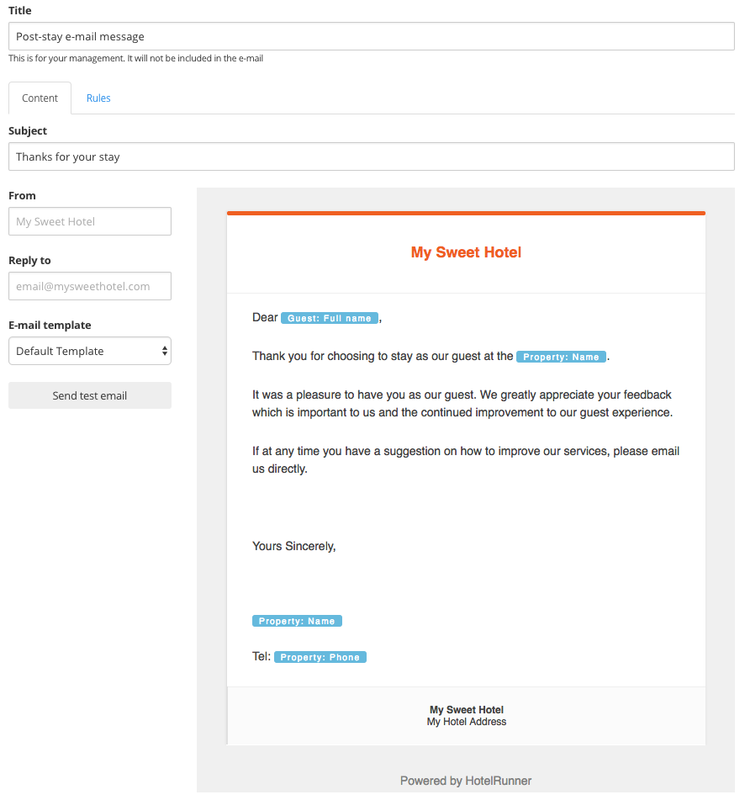 You can follow the instructions to enable Guest Notifications subscription which allows you to engage with your guests before, during and after their stay by sending them automated emails. Click Overview under Guest Notifications on the left menu. You can see prepared e-mail drafts for you in this section. 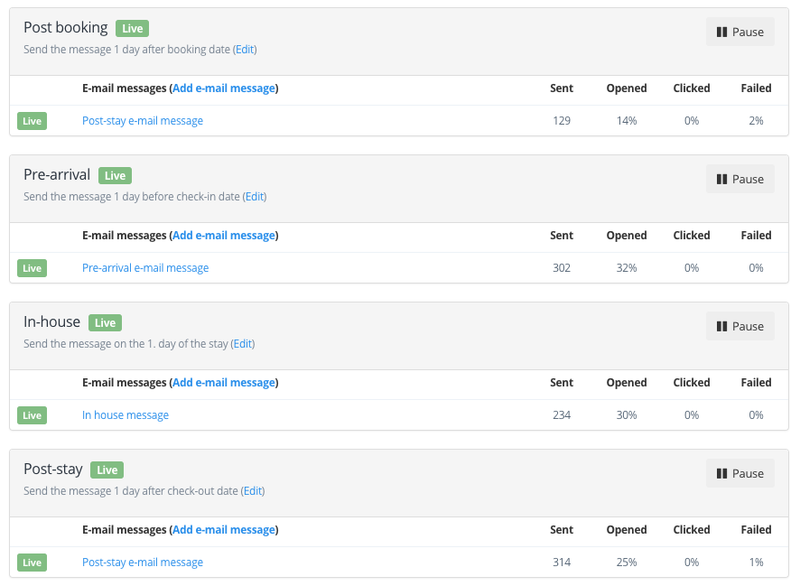 Guest Notifications product can send e-mail at four different time-frame automatically. Pre-arrival: E-mail is sent just before your guest’s check-in. In-house: E-mail is sent during your guest’s stay in your property. Post-stay: E-mail is after your guest’s check out. You can set exact time of automated e-mails which are sent in four different time-frame by clicking “Edit” button. You can see prepared e-mail content at the opening page. Title: Your automated email name which you can see only. Subject: Your automated e-mail’s subject line. From: You can write here; which name would you like to seen as sender. Reply to: You can set e e-mail adress which receives replies of your automated e-mails. E-mail template: You can select a template of your automated e-mails. Send test email: By clicking this button, you can send a test e-mail to your HotelRunner user’s email adress. You can edit your e-mail content by clicking anywhere of the content and also see the editing tools. You can edit your e-mail content with the current editing tools. You can also use Variables which allow you to create rich content while editing. You can see Variables at the screenshot above in blue color. 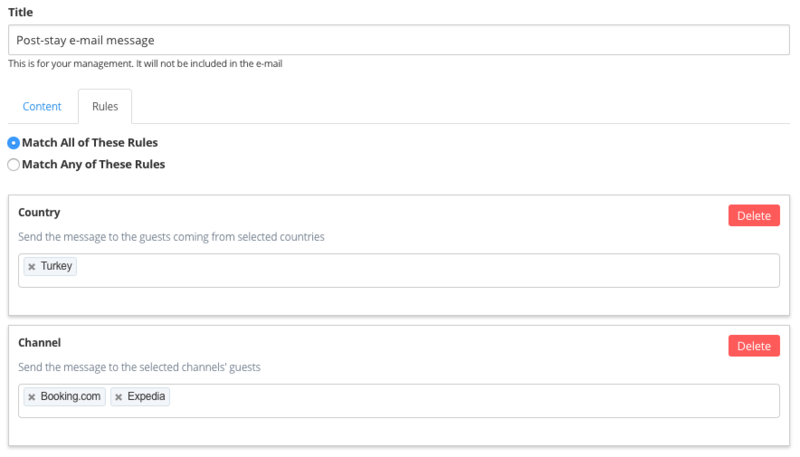 For example you can add your guests’ check-in, check-out dates in you e-mail content automatically. You can set some rules for your automated e-mail. Please click “Rules” section to set. You can set Country and Channel rules. For example: This e-mail will be sent to guests who are from Turkey and have made reservation via Booking.com or Expedia.com in the screenshot above. You can create more than one different e-mail contents with different rules for the following time-frameshazırlayabilirsiniz. In order to add new automated e-mail, please click “Add e-mail message” button of a time-frame at Overview section page. You can change priority of your automated e-mails by dragging with you mouse. So automated e-mail will be sent according to your rules which you set and its priority. Which one will be match with your rules first, it will be sent. You can see the e-mail which already sent at “Processed” page, the e-mails which were planned to send at “Pending” page under the Guest Notifications on the lef menu. 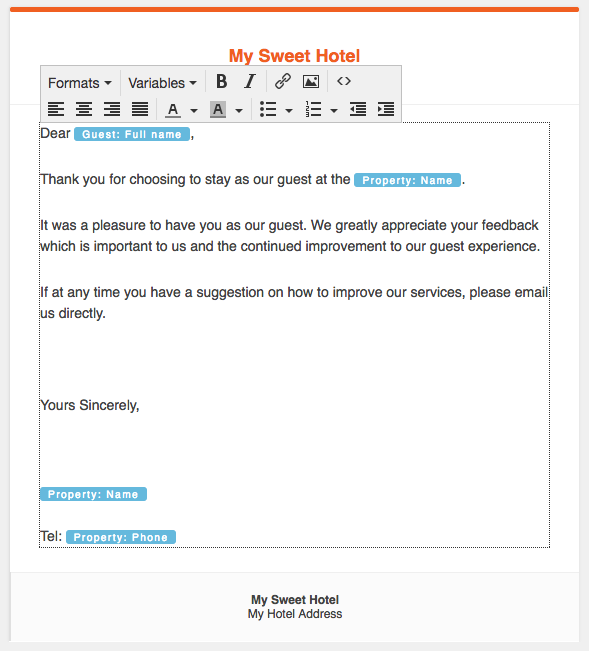 In order to send automated e-mail to your guests, there should be guest e-mail info in reservation details at HotelRunner.